We are pleased to introduce the Poly-strap brand of Pet strapping, produced by Plastofine Industries, India, as per ASTM quality standards for type IV polyester strapping , which has been approved by the American Association of Rail Roads (AAR). The manufacturer is an approved facility with over 10 years of experience. The Pet strap has in recent years gained acceptance and recognition due to its unmatched features – strong, safe, cost-effective and eco-friendly. The Pet strap is eco-friendly because it can be disposed and is entirely recyclable. Further advantages include user friendly and easy use in a wide range of packaging applications, with a simple manual and modern automatic tools which can apply the strapping in a single touch. Applying to tension, jointing and cutting the strapping happens in one composite step. The Pet strap ends can be jointed directly through heat or friction with or without using metal seals. 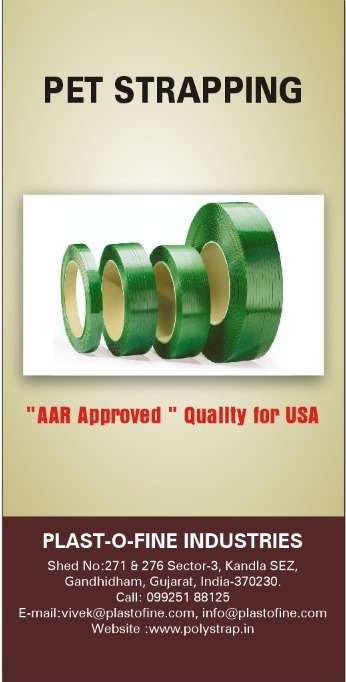 The Poly-strap brand of Pet strapping is AAR-approved and compliant with ASTM standards. The Poly-strap is a win-win choice for customers since it offers all of these advantages along with local sales support in North America to ensure customer satisfaction.